The Mercedes A-Class was always a car to divide opinion. Forward thinking when launched, the upright stance and innovative packaging gave you a large interior within a small car, but at the expense of driving dynamics, even desirability. It was practical, if unorthodox, but rivals from Audi and BMW left it behind. The response from Mercedes is simple; take what makes the Audi A3 and BMW 1 Series sell in such numbers and put that in to a Mercedes. The result is the new A-Class, a car as conventional as the original was inventive, charged with taking the fight to their German rivals. It is certainly a good looking car, carrying over design cues from the larger cars in the Mercedes range such as the sharp lines along the flanks, the distinctive grille treatment and easily identifiable headlights. 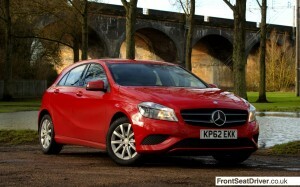 If people are downsizing, then Mercedes are making it very easy to move from the C-Class to the A-Class. 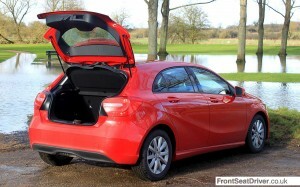 Inside it is much the same, with an interior that borrows heavily from the B-Class. The dashboard is distinctive, with its trio of gloriously retro air vents dominating the centre console, while clear instruments flank a digital display in the instrument panel. Only a display for the sat-nav and entertainment lets the side down. It sits on top of the dashboard, looking like a plug-in unit similar to that in the SEAT Mii and Volkswagen up!, but it is permanently attached, no matter how hard you pull it. It’s also not a touch screen device, something you find out after prodding it for some time trying to set a destination. That aside, it really is a very pleasant place to sit. There is also plenty of room in the rear, although three rugby players might find it a tad cosy. Going all the way to the back, there is an adequate sized boot although it is somewhat smaller than the outgoing model and slightly less capacious as the BMW 1 Series. 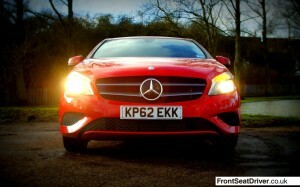 Out on the road you would expect the usual Mercedes balance of slightly sporty with a comfortable ride. Disappointingly, that is not really what you get. 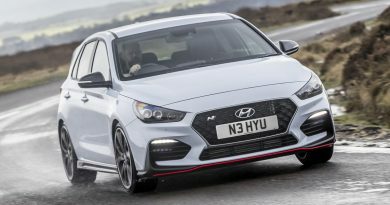 The engines aren’t really to blame, with a range running from a perfectly good 1.5 litre diesel engine up to a 211 bhp 2.0 litre petrol, although don’t think you’ll be able to guess what’s under the bonnet from the badges; an A180 could have a 1.5 diesel or 1.8 petrol, while the A250 takes the 2.0 litre engine. All are suitable for the job, even the relaxed 1.6 litre petrol, although none of them will set the pulse racing. If you do want a little excitement, there’s a plethora of sportier options to choose from, including Sport, AMG Sport and Engineered by AMG. I tried the AMG Sport, mated to the A220 CDi model with its 2.2 litre diesel engine. With those three evocative letters on the boot lid, any thoughts that this might be a relaxing car to drive were thrown out of the window. The stiff suspension made the car feel skittish, bouncy, excitable, but none of it in a good way, instead giving you the sensation that you would be meeting a tree at any moment. I would turn in to a corner, a bump mid way through would send a jolt through the cabin and then the car would be a few centimetres to the right of where it was previously. Braking on a bumpy road led to the ABS kicking in frequently, while the traction control light flashed like a lighthouse under power. More time was spent correcting the cars movements than was spent actually driving the thing. The UK market demands stiffer suspension as most people think that means it’s sportier and the marketing teams react accordingly. There has to be a limit though, and the AMG Sport models have crossed that. One model doesn’t make a range though, so it was fair that I gave the A-Class another chance. Moving down the range to a near base-spec A180 SE, with just 121 bhp to propel it to 60 mph in a respectable 9.2 seconds, life suddenly got much easier. Gone is the crashing, trembling AMG Sport kit, replaced with ‘comfort’ suspension and 15 inch wheel with thick lumps of rubber round them. 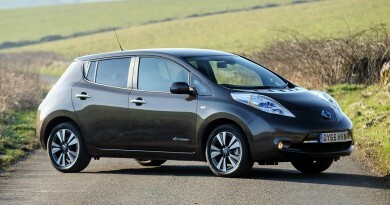 This transforms the ride, making it so much more serene, luxurious even. Despite narrower tyres, progress was quicker too, the damping keeping the tyres in contact with the road at all times and allowing continuous control. Yes, there’s more body roll, but life is always a compromise. With its standard suspension, the A-Class makes a good fist of country roads and will be a delight on a long motorway journey. The AMG Sport suspension is a compromise too far. Leave that option unticked and the A-Class is almost as good as the BMW 1 Series or Audi A3, not quite as dynamic as either, but more grown up and sophisticated. Although perhaps I’m wrong and the marketing guys are right. Perhaps it’s all just a sign of me getting old. Mercedes being the most expensive luxury car in the world that one can dreamed to have. Mercedes logo says everything and making the car most expensive in the part of world where brand is everything. Normally people of average standard not preferring Mercedes Benz due to its excess price even though they also want the same. makes the Mercedes marketing a bit tougher than before. Companies like Audi, BMW, Ferrari, Lexus, Jaguar also making the most in the market and also offering the quality luxury cars and making it difficult for Mercedes.